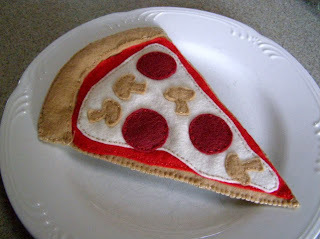 Random Crafting Adventures: Felt Pizza - Almost Good Enough to Eat! To make a pattern, I drew a circle on copy paper, cut it out, then folded it into six triangles and cut one triangle out for a template. I made a template for all the pieces I needed. The foam triangles have slightly rounded corners, and one of the pieces of beige felt has a longer outside edge (which will eventually become the folded over crust). If anyone is really keen to make their own pizza, I can email this PDF template to them. I cut six triangles of white foam, six triangles of beige felt in each size, six tomato sauce shaped red felt triangles, six cheese shaped yellow felt triangles, 12 small burgundy felt pepperoni circles, and 12 small beige felt mushrooms. These are all the pieces you need to make each pizza triangle. I began by hand sewing the mushrooms and pepperoni onto the yellow felt. I then used the machine to sew the red tomato sauce layer to the smaller tan triangle, and then to sew the yellow cheese layer on top. I then placed the appliquéd top layer on top of the larger beige base layer (right sides together) and sewed around two sides of the triangle. I trimmed the point and turned the triangle out. I then inserted the foam triangle inside the pizza. To help make a neat crust I trimmed the extra felt from base layer of beige felt. This is essentially the excess seam allowance, that you don't need on the crust flap. I then pulled that extra edge flap over, pinned it in place and stitched it down. The very last step is to trim the excess felt from the crust edge. It's much easier to sew the edge down when there is some extra fabric, and then trim the excess afterwards. You end up with a much neater crust edge. This has been a huge hit with the girls. They play with it all the time. I've also found that, even though I used inexpensive synthetic felt, it has held up pretty well. If anyone out there is keen to make their own pizza, I did scan my templates before I tossed them out. Just send me a message and I can email you a PDF. I love this pizza and think it will make a brilliant school holiday activity to do with my kids. School holidays. Argh. Can you please send your template to frommumtome[at]hotmail.com, thankyou. I also wanted to thank you for the lovely comments that you have been making over at Relentless. I think it is wonderful when people take the time to make a comment and I am really glad you have been enjoying it. Keep up the awesome crafting adventures. Thanks Shannon. I've just sent you an email with the template attached. Let me know if you have any problems with it. Thanks for the support. I've been thoroughly enjoying trawling the archives on your blog. Fabulous writing. you can send me the pattern for making pizza Felt please? Hi Silvia. I emailed you the template yesterday. It's saved as an A4 size PDF document. Let me know if you have any problems with it.